Churning dark edged kosmische from Jaime Fennelly and friends. There’s a pleasing synergy between electronic and organic as the female voices of Haley Fohr (Circuit des Yeux) and Janet Beveridge Bean (Eleventh Dream Day) swap places with the pulsing synths and rhythmic fiddle. Meditational, trancelike, adventurous, with a minimalist sway that’s satisfyingly cathartic. Alternative pop belter from the veteran Australian duo. A sawing cello and simple acoustic guitar strum tend to mask the murky depths of the song, as Karl Smith’s sweet voice, reminiscient of Jonathan Richman or Stuart Murdoch, intones about bonfires on Christmas Eve. However, an early clue is delivered in the shape of this ear catching line, soon I’ll burn all these fuckers around me. As the song gathers a kind of VU style pace and power with a vocal background drone like a choir of the dispossessed, Smith ups the ante. So I’ll kiss this medal when they come to get me. And a chill sets in as string feedback swings back and forth until the final rowdy refrain which comes on quite like ‘Venus in furs’ on smoother drugs, all bumps and grinds and chaotic rumbles. A miniature masterpiece of incendiary songwriting. Sumptuous mood piece from Doug McCombs and friends from only the fourth Brokeback album I was surprised to learn, although of course McCombs has been plenty busy with other projects. If the title suggests cinema, so does the quietly intense atmosphere – a weary travelogue maybe, or a melancholic memoir. The gorgeous slowly unwinding guitar lines smoulder, reminsicient of McCombs’ work with Tortoise, and underneath a bed of steel guitar shimmers. Instrumental music doesn’t get much more beautiful or meaningful than this. A beautiful follow on from the Promises EP of last year from Guy Blakeslee and friends. It’s a sweet song about love in roughly folk guitar picking clothes but with a great supporting psych pop ensemble of warped strings, vibes and massed singers, suggesting the vaguely unhinged quality that can often accompany amour. It builds to an uncomplicated lovely rush and breaks back down to just Blakeslee’s very endearing vibrato voice. A dreamy half there thing of beauty from the American west coast. There’s a fragile atmosphere, an air of late night fretfulness and the bare bones arrangement contributes fully to that feeling. Tentative plucked guitar, whispered woodwind and Alexei Erenkov’s reedy self deprecating vocal. That the lyric refers to dangers or unseen risks – “if you’re on the water better beware – only adds to the sense of something precious and intimate. 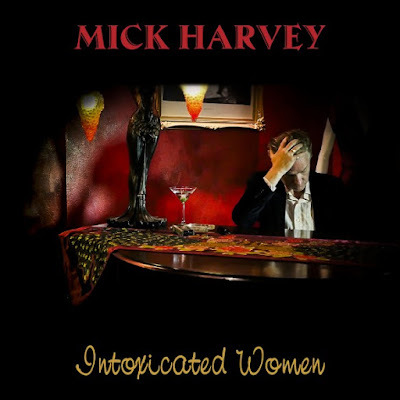 Mick Harvey has just released his 4th album of Serge Gainsbourg interpretations, the wonderful Intoxicated Women. The first track on it is a great cover of 'Je t'aime', in German ('Ich liebe dich') with the memorable vocals of Andrea Schroeder taking the part of Jane Birkin. Depending on your susceptibility to female sighs and intimations, very possibly not safe for work. Any excuse for a classic cut from the man himself Serge, a bit of Melody Nelson with tremendous orchestrations by Jean Claude Vannier. Benoit Pioulard, August Wells, Happyness, OOIOO all playing around or about these parts soon. Basil Kirchin is a revered cult figure in outsider music (subject of a recent festival in Hull), check his gorgeous mixture of jazz and birdsong/field recordings. And The Saxophones, a sublime late night disquieting dream of a song. Another absolute joy of an album of Serge Gainsbourg interpretations from the former Bad Seed (his fourth and apparently final), this time focusing mainly on the outstanding but maybe a shade lesser known back catalogue of duets. A couple of love songs (of sorts) to kick off the Valentine's Day show. The sublime version of 'My funny valentine' by Kathryn WIlliams & Anthony Kerr, a smouldering take with a distinct air of desolation in the spaces between the lines. Laetitia Sadier Source Ensemble showing 'Undying love for humanity', which is tough to do but music as great as this makes it so convincing. Warm Digits are a duo from Newcastle who make furious beat driven animals and here have Field Music in on guest vocals to wonderful effect. Goldfrapp being filthy and there's not much better in life than Goldfrapp being filthy. Urban Farm Hand make a lovely folk/kosmische hybrid. And Foxygen being bonkers and beautiful and soulful. Delirious sweeping white soul from the LA duo, adding some welcome bonkers baroque flourishes to the cosmic stew. We like progressive tendencies around here and a part of this is a heady brand of progressive pop. It comes on like Todd Rundgren arranged by Curtis Mayfield, with top notes of swooning strings and the middle ground full of wonderful staccato brass. Apparently a 40-piece orchestra was involved on the album, arranged by Matthew E. White no less, and this song shows every sign of that (why bother says you if there wasn’t going to be every sign of it). Not to get bogged down in politics, but this kind of vaguely unhinged and entirely distracting pop belter could be THE most effective political response in these times, know what I’m sayin? Peter Walsh appeared twice in this week's show. First in his own right as The Apartments, from his most recent wonderful album No song, no spell, no madrigal. Then guesting on the final album from Piano Magic, what a voice, lived in, soulful, stoic but full of sadness and regret. The Saxophones are a new band on me and I like what I hear. There's a hint of 50s rock n roll balladry about this song but in a more hushed atmosphere which is entrancing. Mick Harvey is back with another wonderful album of Serge Gainsbourg interpretations, lots of tremendous duets, many in German which is superb to hear. New music from Canada's The Dears, sounding as fresh as ever. UK out there jazz from The Comet Is Coming & Dinosaur, both playing in Ireland soon. And some Jacques Tati soundtrack music from Frank Barcellini. Marvellous. Some odd things this week. Odd can be beautiful. Ariel Pink & Weyes Blood joining forces for something epic and strange. Half Japanese with legendary force for good Jad Fair sounding in great voice. Stephen EvEns coming on like a Cardiacs outtake, excellent. New music from Goldfrapp, not so much odd as just brilliant. And not odd at all, exactly as you'd expect, glorgeous songwriting from Mark Eitzel, who is on tour in Europe soon.